Enable the insertion of parallel opening and top hung units, and solar energy generation. Ability to achieve the look of all glass. Seamless integration with BIPV modules. TRU Curtain Walls deliver the ultimate in window design and engineering. With structural glazing systems, a completely flush-fitted façade design is possible. An innovative generation of fittings with a particularly streamlined range enables the use of heavy vent weights - utilizing our zero sightline windows. For more security and comfort, there is a specially developed ratchet stay for projected tophung opening units, which secures the window at any opening angle for changing wind loads. Fabrication is streamlined by reducing the total number of individual parts to be processed and using similar parts. The systems are suitable for luxury residential applications, and custom curtain walls are available in a virtually limitless array of sizes and configurations. TRU can accommodate exceptionally large openings that do a great deal more than look spectacular - they control light, temperature, and noise. U Factor Contact for value. Please note all specifications may vary depending on individual building conditions. Anodizing is an electrochemical process, in which the aluminum is immersed in an aqueous electrolyte solution. This results in a colourless, transparent oxide film, which protects the long-term appearance of the metal while producing a sleek, subtle finish. Clear anodized aluminum is the TRU standard, and a select range of tones are available. Our multiple coat Kynar paint is the coating of choice for pre-formed architectural aluminum, and it's available in an array of colors. All TRU products can have a consistent finish utilizing this paint. Kynar is suitable for coastal, desert and mountain climate, as it's is resistant to chalking, fading, chipping, and peeling. Kynar liquid coatings meet AAMA 2605 performance specifications. For the look of Stainless Steel, TRU Stainless Steel Clad provided exceptional value and reinforcement. Finishes are sleek and include polished gunmetal, polished steel, and brushed steel. Our automation system is the first generation of mechatronic fittings to combine energy management, security, building automation and design. This automation is easy to integrate into Curtain Wall facades, and all motorization takes place in the back box, giving you a clean aesthetic. The new series of universal handles completes our range of technologically advanced products for all aspects of opening units in a Curtain Wall facade. The uniform design range is extremely easy to operate and has an impressively clear language of form. The combination of design and technology accommodates the special requirements for fire protection as well. Tinted glass, colored glass, privacy glass, cracked glass, reflective glass, laminated glass, tempered glass, etched glass and prints inserted in glass. *Photo courtesty of Schott Glass. 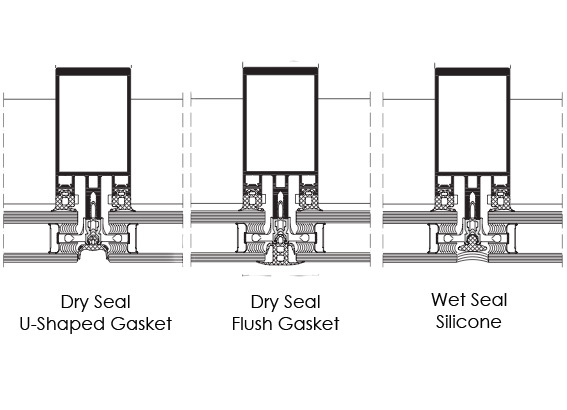 Dry gasket options are available in addition to a traditional wet seal for Structurally Glazed Curtain Wall. Advantages of choosing a EPDM dry gasket include reduced installation time, ease of replacing glass, and aesthetic appeal. Prosol applications can be integrated in to all facade applications ranging from architecturally complex new builds, to energy related retrofits that make a smart investment. All TRU systems integrating Prosol photovoltaics maintain their functional product properties. TRU works with many respected glass suppliers and ever expanding glass specifications. Glass type and coatings will be carefully selected on a per project basis. The TRU Standard Glass Package generally includes a dual-glazed unit. Contractors prefer the quick and easy installation process of TRU systems. Ability to achieve the look of an all glass façade. 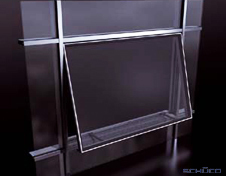 Ability to integrate venting windows that are virtually hidden when closed. Energy generation and cost savings available through BIPV. We'd like to announce that Internationally renowned market leader Schuco has re-structured Operations in the US. This shift combines a highly sophisticated product scope with local manufacturing. As Schuco's West Coast partner, TRU manufactures their systems in their state-of-the-art facility in Hawthorne, CA.